Get ready for your bank account to be raided, as BlizzCon tickets go on sale on April 20 and April 23. Speaking of Blizzard, why not check out the best Hearthstone decks. BlizzCon is returning to the Anaheim Convention Center on Friday, November 4 and Saturday, November 5, 2016, for the convention’s tenth year. If you want to head to the actual convention in California, BlizzCon 2016 tickets will go on sale in two batches on Wednesday, April 20 at 7pm PT and Saturday, April 23 at 10am PT through the online event ticketing service Universe, priced at $199 each, plus applicable taxes and fees. If you’re feeling like splashing out, though,there’s also a special pre-BlizzCon Benefit Dinner the evening of Thursday, November 3 in support of Children’s Hospital of Orange County. Here you’ll be able to mingle with developers, artists, community team representatives, and other members of the Blizzard family. Tickets go on sale Wednesday, April 27 at 7pm PT, priced at $750 each, and attendance will be limited. Head over here for more information on that one. If you’re like me and you don’t want to ever leave the house and you hate people, especially sweaty people in very close proximity, you’ll probably want to grab a virtual ticket and watch the event online. Prices aren’t up yet, but you all the information that is can be found over on BlizzCon’s event info page. 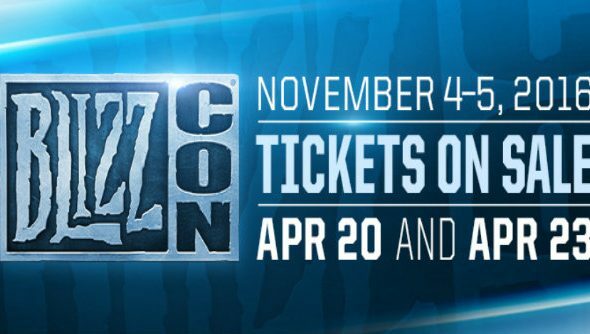 BlizzCon 2016 takes place on November 4-5.